Bitter gourd, bottle gourd, wax gourd, snake gourd, sponge gourd, and ridge gourd are cultivated and marketed by smallholder farmers, and are important crops in home gardens throughout southern and southeastern Asia. These vegetables provide significant dietary nutrients such as vitamin A and C, iron and calcium. Public sector breeders and germplasm curators release open-pollinated varieties of these cucurbits developed through selection from landraces. Private sector breeders develop F1 hybrid cultivars of these gourds that are popular with growers because of their uniformity, early and total marketable yield, and, in some cases, disease resistance. 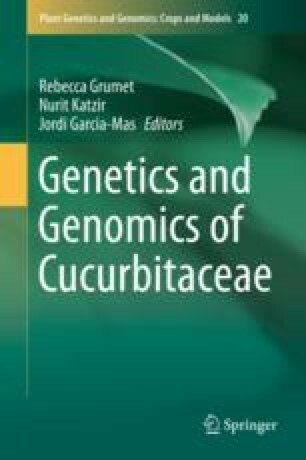 This chapter reviews the status of germplasm resources for sustained genetic improvement of these cucurbit species. Susceptibility to viruses is currently the major production constraint for these gourds, and systematic evaluation of their germplasm against viruses will be helpful for breeding improved cucurbit lines. The germplasm resources of these gourd species are held in an array of genebanks in several countries and may not be readily available for scientific research or to commercial breeders outside of their respective country. Many accessions of these gourd species listed by the World Vegetable Center and the U.S. Germplasm Resources Information Network are either not available or inactive. More accessions of these gourd species and their relatives need, therefore, to be collected from various regions of the tropics, conserved, and evaluated to ensure continuous genetic gains in breeding programs. World Health Organization.. Global report on diabetes. 2016. http://www.who.int/diabetes/global-report/en/. Accessed 1 Mar 2016.